So what could possibly be more exciting than confluence hunting in an area populated by dangerous tigers? We were staying at the fabulous luxury tent camp Churhat Kothi. Lucy, the wonderful manager helped arrange for the trip. Although, since no one at the camp had ever been to a confluence before, they made no guarantees that we would successfully complete our journey. After the morning game drive (on which we saw our fifth tiger of the vacation!) we took off in an off-road 4x4 Gypsy loaded down with food and supplies. Rajkishor was an excellent driver, completely familiar with the local roads and directions. Mohan packed a terrific lunch and came along to help set up our picnic. Confluence hunting in luxury style! We took the main road North from the lodge through the Panpatha Sanctuary, then through Panpatha Village. About one kilometer past the checkpoint in Panpatha village, there’s a fork in the road – we went left, heading towards the known destination of Mahrol Railway Station. We took a bumpy dirt road for the next 14 kilometers, without getting any closer to the destination. We passed through the highly photogenic villages of Paljah, Chilhari, and Mahroli, before arriving at the railway station. Just North of the railroad tracks is a brand-new well-paved road. We cruised in style the last ten km towards the point, before getting close enough to look for a side road to turn on. At a spot about 1 km south of the spot, almost due south, we found a small dirt road heading north. No guarantee that this was the best route to take! So we kept going another km or 2, checking for larger side roads, before deciding to turn around and take it. Good choice – it goes almost straight to it. We off-roaded for a while in fields and dirt flats. Raj commented on our good luck in not choosing the monsoon season for this trip – the fields would have been flooded, rice would have been growing, and the roads would have been impassable. Luckily, the confluence itself is several kilometers away from any tiger habitat, so the hiking was quite safe. We found a shady parking spot within a few hundred meters of the spot, and took off on foot. 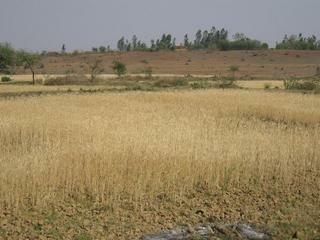 To keep from disturbing the farmer’s work, we walked mostly on the built-up dirt ramparts between fields. It must have been slow season, or afternoon nap time, because we didn’t see anyone out working in the fields. When we finally found the exact spot, it appeared that wheat had recently been harvested, and there was ready-to-harvest wheat in nearby fields. We found the spot, took our photos, and headed back to the car, where Mohan prepared glasses fresh lemonade for our celebratory toast. To get back, we took the more direct road through Chansura village. Along the way, Raj kept an eye out for a nice shady spot for our picnic lunch, and found it in a mango grove at 23.928N 81.022E. A herd of water buffalo was grazing nearby, and women working in the fields were coming home with their harvests bundled on top of their heads. Raj spread out some blankets and Mohan got some fantastic Indian food ready for lunch. About ten local villagers gathered to watch us eat. We took their photos and wrote down their addresses so we could send them copies. Then we headed back – all told, just around 4 hours round-trip. On the way back to the camp we stopped at Raj’s house to meet his family – he lives in Panpatha village, just south of the sanctuary’s southern border. Bandhavghar Wildlife Refuge is a long trip from Delhi, but definitely worth it. We took the 18-hour overnight train, then the lodge picked us up at Umaria station for an hour-long drive to the tents. The tents are located about halfway between Umaria station and the confluence point.